[RetroConsole] Vectrex – I ❤ Old Games! Throughout all the history of gaming consoles we’ve seen all kind of oddities: the ginormous Atari 5200, the Coleco Telstar Arcade, Nintendo’s Virtual Boy and in recent years Mattel’s HyperScan, but for sure a console that cannot be fogotten in this particular list is the Vectrex, released by General Consumer Electronic first and Milton Bradley later in November 1982. Not only a quirk for its shape and controls but a unique piece since in a world dominated by “raster” home consoles, the Vectrex was the most famous one (if not the only one) do display vector graphics. The original idea of Vectrex came in 1980 from an idea of Mike Purvis, Tom Sloper and Steve Marking. Their first project however was that of a portable console with a 1″ display, the Mini Arcade, that eventually became a tabletop with a 9″ screen. It was quickly licensed in 1981 to GCE, the entetainment department of General Electric and was presented on June 7th, 1982 at Summer Consumer Electronics Show in Chicago. 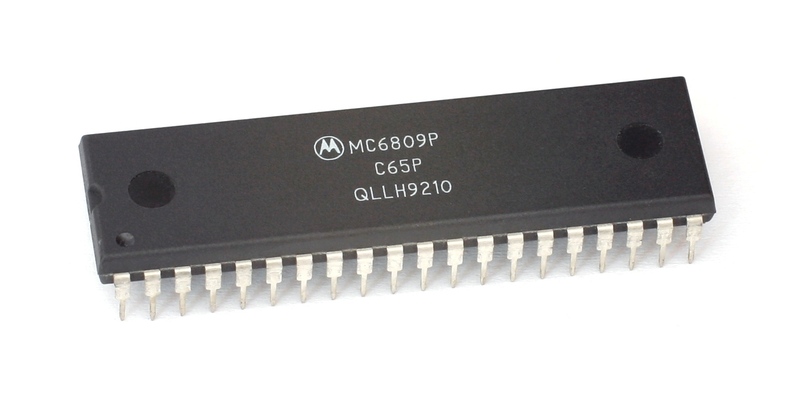 The hard work in the Vectex is done by a Motorola MC68A09 chip clocked @ 1,6 MHz. One of the iteration of this chip was mounted on the TRS CoCo and on the Dragon 32/64. The console has 1K of RAM and 8K of ROM and the games cartridges are 32K each. The sound was managed by the General Instruments AY-3-8912 of the family of the AY-3-8910, popular in the arcade cabinets and installed also in computers such as MSX, Atari ST, Amstrad CPC, Oric 1 and ZX Spectrum 128. 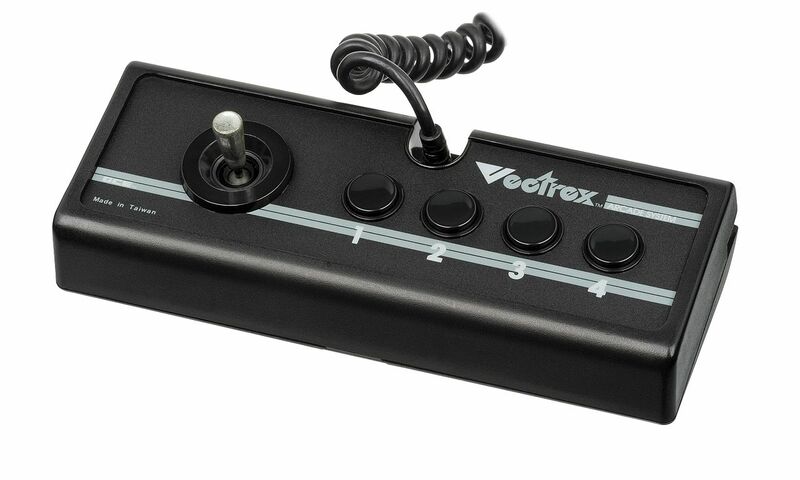 The Vectrex comes with a built-in not detachable controller in a shape of a “regular” NES controller but larger and with four, not two buttons on the right. On the left there’s room for a small joystick. The main, huge difference between the Vectrex and otherS home consoles is the vector graphics system. A quick step back: console and arcade games are divided in two main categories: raster graphics and vector graphics. In the raster graphics the screen in divided in a sort of matrix in which every small sqaure (a bitmap) can be coloured or no. The set of bitmaps result in an image. Every “dot” is displayed on screen individually but we can see the image due to the phenomenon of the persistence of vision. In vector graphics the “dots” are not drawn in a specific position but the electron beam is deflected and modulated to for more sharp images. The main issue with this system is that the graphics can be also monochrome, black or white and that’s the reason why vector graphics have been replaced by raster graphics. Since the graphics are monochrome, along with the games were bundled some plastic overlays to put on the screen to give the illusion of full color display. Officially were released only 29 games for the Vectrex and some of them required some particulat peripherals designed for it: for example Animaction, Art Master and Melody Master requires the Light Pen while 3D Crazy Coaster, 3D MineStorm and 3D Narrow Escape needed the 3D Imager. Due to the relative rarity of the console, that shows up constantly online between 200 and 300€ at least, also the games are a bit expensive to collect. Especially two are the Holy Grail for collectors: the first is the special edition of Clean Sweep, called Mr. Boston from the name of the eponymous liqueur company and the second is MineStorm II. This one was an unbugged version of MineStorm bundled with the console that automatically crash at level 13. Since not so many people owned a Vectrex and even less reached level 13 due to the difficulty of the game, there are nowadays only a few copies of MineStorm II that Milton Bradley shipped via mail free of charge to whoever asked it. The vector monochrome graphics, made all the games look pretty much the same. There were for sure some Arcade games that uses vector graphics (being one of the most famous Star Wars, released in 1983) but porting this technology on a home console in the early 80s was no simply at all. And most important very expensive. To fix the “problem” of monochrome and very little funny interface, along with the games were shipped some color overlays to put on the screen to give the illusion of the color. An easy, smart but terribly outdated solution that could have been an idea in 1972 when the Magnavox Odyssey was originally released, but not in 1982. 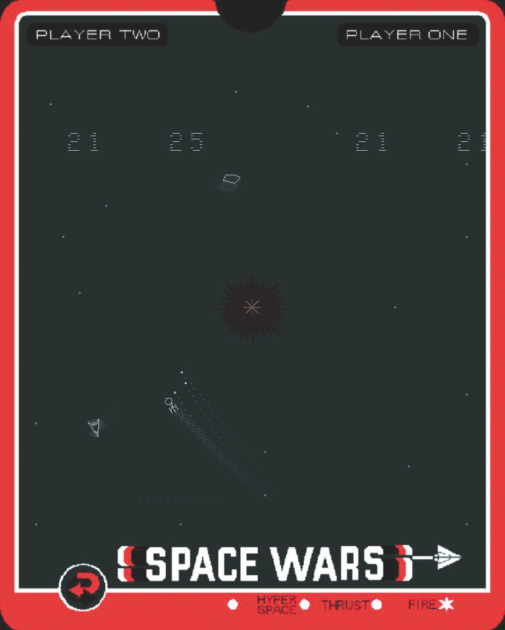 The best game of the console is universally considered Space Wars (no, not Star Wars), a simple while hectic and funny game thad, despite the limitation of the console, hold up well even today. Despite the first sales were encouraging, Vextrex was, in the end, a commercial failure. Distributed in Europe by Milton Bradley and in Japan by Bandai it never reached the number of sales MB had expected when they purchased GCE. The video games crash definitely killed the console and after the storm, in 1984 the Vectrex was retailed at 49$: way less than the 199$ when it came out. The same year Hasbro merged with MB and soon after the console was discontinued after only two years and millions of dollars spent for the development. Despite its short lifespan and the little distribution a small community of fan still have a soft sport for the Vectrex and they still realize game for it, especially from the mid-90s when Jay Smith of Smith Engineering who owned the right of the Vectrex, decided to allow the development of new software for free. Smith also tried to release an handheld based on the Vectrex philosophy but after the universal success of the GameBoy opted to withdraw the project. One of the few, if not the only interesting feature of the Vectrex has been the 3D Imager, years before Sega released it for its Master System. The Vectrex is awesome. Sadly the short supply, and high demand means for a loose incomplete unit you’ll pay beyond its original MSRP these days. Still, if you have room for one, and $250 it is worth owning. I don’t own one, but I know a few people who do, and the console does live up to the promise of arcade quality at home. Especially when you consider that Vector graphics tech is what was driving a lot of arcade games at the time. Atari’s Star Wars games, Major Havoc, Black Widow were some of them. Sega had the excellent Tac-Scan. Really the main problem with the Vectrex was timing. It came out as the crash was looming, and developers were slowly shifting toward the Home Computer platforms for the added horsepower, as well as shield themselves from what would come. Some games worth checking out on the Vectrex include the excellent port of Berzerk, Spike, and the slew of great homebrew. There’s even a homebrew port of Thrust, which was originally a Commodore 64 release from Firebird! Pingback: [Picks of the Month] October 2018 – I ❤ Old Games!